Venice attracts some 20,000,000 tourists a year. Add in a local population of 55,000, and you're talking about a big appetite for groceries. 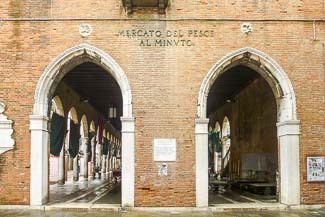 Since the year 1097, Venetians have depended on the Rialto markets for their daily supplies of fish, vegetables, fruit, and other foodstuffs. The markets are open to the public, and there's no better show in town. Stevedores unload crates of produce from barges; vendors hawk their wares; restaurant chefs examine the daily supply of fish, crustaceans, and bivalves; delivery men push handcarts laden with fruit and vegetables. 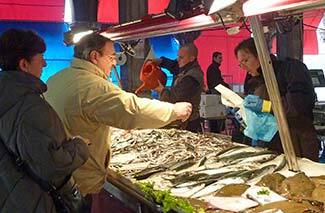 It's best to arrive early if you want to see the Erberia (vegetable market) and Pescheria (fish market) in full swing. The barges start arriving at dawn, and the vendors are bargaining with customers by 8 a.m. The wholesalers and most of the retailers close up shop by midday (or 1 p.m. at the latest), so stock up on fruit and photo opportunities before lunch! Vaporetto lines on the Grand Canal stop at Rialto, on the left bank of the Grand Canal. From the waterbus platform, head for the Rialto Bridge. Cross the bridge, then dive into the mass of people and stalls on the opposite bank. Work your way to the right, and you'll encounter the Erberia along the water. The Pescheria is farther along. Go through the archway at the far end of the Erberia, then continue past the Fabbriche Nuove to the Campo della Pescaria. See our Pescheria (Rialto Fish Market) video at Venicetravelblog.com.